In a microwaveable bowl combine dates and water; cover and microwave on High for 1 minute or until softened and water is absorbed. Scrape mixture and beans into food processor with almond butter and cocoa powder. Puree until very smooth; stopping and scraping down sides a couple of times. Scrape mixture into a bowl and stir in chocolate and vanilla. Chill in refrigerator for about 45 minutes or until slightly firm. 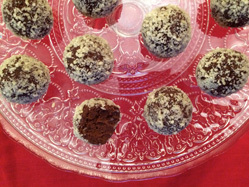 Using a mini ice cream scoop or tablespoon, roll into balls and place on small baking sheet. Roll into ground almonds and keep refrigerated. Prep Time: 15 min. Cook Time: 1 min. Makes: 20 Source: www.heartandstroke.com (recipe developed by Emily Richards, PH Ec. ).